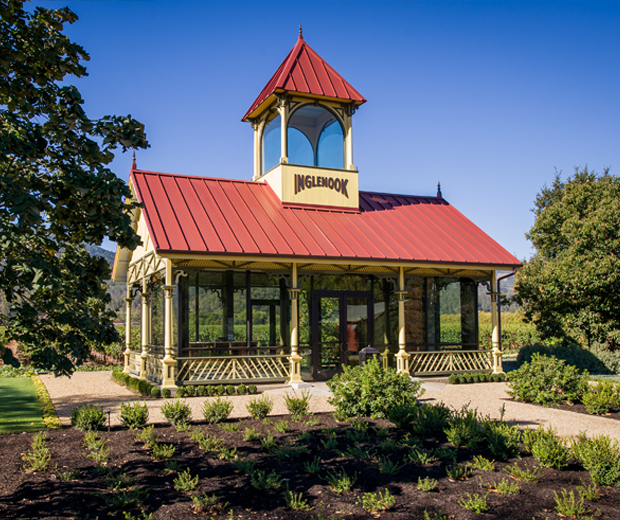 We are pleased to announce the long-awaited opening of our new Visitor Center, situated at the entrance to the estate. The building, originally constructed in 1886, was used as a water storage tank house on the back of the property. It was capable of storing up to 20,000 gallons of water collected from nearby mountain springs which were used for winery operations. Rather than build something new, the Coppola family wanted to share this rarely seen, historical building with a wider audience. Over the past two years, the building has been carefully relocated to the entrance and restored as a Visitor Center, where we will welcome visitors. Guests will check in here before proceeding to the Chateau for their experience. In the coming weeks Heritage Society members will receive information about special access, allowing them to proceed directly to the Chateau. Members, contact heritagesociety@inglenook.com for details. If you are using a driving service for your visit to Inglenook, please plan on retaining their service until after you have checked-in at the Visitor Center and you have been delivered to our Chateau behind the gates and down our driveway.